1Herbert George Wells (1866-1946) is known as the pioneer of science fiction and his view of man's cosmic destiny has been considerably influential in twentieth-century fiction. Wells did not consider his fiction as works of art but as the objects of a struggle partaking of an ideological enterprise. He was a socialist but not a Marxist as has often been suggested. Therefore, he had faith not in class struggle but in the mere scientific education, which he thought, could give man an absolute power over nature and over himself. In his tradition, in the twentieth century, science fiction became a genre in which miraculous discoveries, heroic space exploits and strange visitors help to ensure human survival in the short term but are of no avail when it comes to changing man's ultimate fate. Over time, the influence of the French and the industrial revolutions had led to believe that some kind of earthly paradise was attainable and at the end of the nineteenth century a literary sub-genre of science fiction developed which brought into focus Utopian orders.1 The main contribution was Wells'A Modern Utopia in 1905, which Hammond, his biographer, describes as "a hybrid between a realistic novel and a romance" (154) and as caught "between fictional narrative and sociological essay". Later, the clear impossibility of Utopia also encouraged writers (Wells included) to portray its converse and dystopia gradually appeared in the 1920's. If Jamal Mahjoub's hero Rashid Al-Kenzy strangely recalls Wells's Edward Prendick in The Island of Doctor Moreau (1896)—both men being the only survivors of shipwrecks—the two writers belong to two different literary eras; Wells generally being labeled a modernist writer2, whereas Mahjoub is a post-modernist novelist. However, both men stress the unlimited pursuit of increased knowledge and power over nature. This often demands that the hero abandon or shed his past self to try and become another man, to try and live without relying on any supernatural agency in an attempt to reconcile the artist and the scientist within himself. 2In The Time Machine (1895), Wells portrays a typically anti-utopian hero. The inventor of the time machine "thought but cheerlessly of the Advancement of Mankind" (Epilogue, 105). As Parrinder shows in his article "Wells and the Aesthetic of Utopia", although Wells always laid emphasis on the contrast between science fiction and Utopia, the author suggested that the gap between what he termed "utopian desire" and "anticipatory futurist writing" could be narrowed and even bridged thanks to the efforts of a particular group: the community of scientists. Interestingly enough, Mahjoub's The Carrier expatiates upon the effort of a scientist, Hassan, to discover (or uncover) the truth about a strange archeological site unearthed in Denmark. The two authors are thus close on this point. Not unlike Edward Prendick either, Mahjoub's hero, Rashid, ends up facing the hostility and hatred of the indigenous population of a foreign land and finally manages to escape on board a ship bound for his country. Besides, it could be argued that Hassan is Rashid's double because the two of them walk on parallel paths (although distant in terms of time). They are both of Arab origin, are strangers in northern Europe, bear the stigmata of the Other par excellence, and end up returning home with a knowledge that they can hardly word yet. 3Both authors appear to be concerned with the Other, that is with those considered by members of a dominant group as alien, exotic, threatening, or inferior because of different racial, sexual, or cultural characteristics. The theme clearly pervades the two authors'writings since The Time Machine also portrays the flight of "the Time Traveller" from the land of the ferocious and revolting Morlochs after he has succeeded in finding again the machine they had stolen from him. But whether in Wells's or in Mahjoub's fiction, flights are never meaningless. In The Carrier, Rashid escapes fire (like Wells's "Traveller") and leaves with a knowledge he has been made aware of in a moment of epiphany brought about by Sigrid, a very intriguing woman. In the case of The Time Machine, knowledge may be symbolized by the two strange flowers that the hero is supposed to have been given by Weena, an "Eloï" he rescued from drowning: "And I have by me, for my comfort, two strange white flowers [...] to remind me that even when mind and strength had gone, gratitude and mutual tenderness still lived on in the heart of man." (Epilogue, 105). For Mahjoub as well as for Wells, the other is the savior, the eye/I opener and otherness is in this case represented by women. 4In Mahjoub's as in Wells'writings, the Other is also "the Other within the self', the uncanny, as it were. In A Modern Utopia (1905), the search of the other within the self can be perceived in the narrator's desire to meet his Utopian double and the botanist's discovery of the double of the woman he loved but lost on earth:" It is Mary. [...] There she is—! Oh, but I have dreamt of her! And now—"(354-6). When the latter meets her at last and she is, for the sake of comic relief, not single, the "bubble bursts", as the title of chapter 11 clearly expresses, and the narrator and his acolyte are immediately returned to earth: "There is no jerk, no sound, no hint of material shock. We are in London..." (358). It is the momentary intense emotional state of the botanist which leads to this fall since he suddenly experiences a true moment of epiphany and has to perceive himself as other, for fear of going crazy. Similarly in The Carrier, Rashid is suddenly seized by an unsustainable feeling as he realizes that Sigrid, who wakes the Other within him, "has devoted her life entirely, selfishly, to learning; nothing else has ever taken her attention. In this they are bound". (245). Thanks to—or because of—-her, he "had peered into the well of knowledge and felt real fear" (274). 5This is the point on which Mahjoub and Wells differ from classical reflection. Descartes "cogito ergo sum" is mostly a thought of self-awareness—I think therefore I am. Consequently, conscience has to be apprehended as isolated from the rest of the world and disregarding the other's presence. This philosophical reflection belongs with a state of solitude which may boil down to solipsism. On the contrary, Wells (before Sartre's L'être et le néant) and Mahjoub, a few decades later, show how the other endangers the self in that s/he questions the hero's essence as a subject. In the case of the botanist, the "Time Traveller" or Mahjoub's hero Rashid, the one who makes the hero an object and who limits or conditions the hero's freedom is a woman. 6Sigrid is not only Rashid's alter ego, she is also a heathen figure since she is evidently depicted as a Medusa figure. If women in The Carrier are described as sorceresses or as still (ed)-life (in the case of Hazin's wife for instance), Sigrid is one of those "who possess the'eye'" [and the I (?)] (229) and as such she should be approached cautiously—at least that is Rashid's old Feki's advice: "two things to be afraid of: the sea [la mère?] and women who possess'the eye'". But before experiencing the moment of epiphany, Rashid is "for the first time [...] unafraid to allow his eyes to examine her ". As she is slumbering, "[her] dark hair [...] emerged from beneath the border of the black scarf'and the moment when she stirs, Rashid is petrified "[h] e became like a stone—not even breathing" (231). However, when she sees him, she gives out "a startled scream" and falls to the floor. Rashid is thus a Perseus-like figure since they are both "frozen in that position" (232). 8Similarly, Mahjoub's travelogue mostly seems to seek to debunk Utopia as an enterprise. On two temporal layers, the sixteenth and the twentieth century, the narrator sheds a particular light on two ambitious and Utopian projects: the observatory Heinesen strives to build and the excavation camp in which Hassan's presence is needed. The observatory can be envisioned as a Tower of Babel whose building is halted because of the confusion of tongues, more precisely in the case of The Carrier the accidental death of a child: an innocent casualty. As a matter of fact, whether in Wells'or Mahjoub's fiction, the course of Utopia never runs smooth and errancy—be it in its archaic meaning of straying or that of mistake—is always a hazard as well as a prerequisite to awareness. The epitome of this is constituted by the wanderings of the narrator and the botanist presented in a Modern Utopia (1905) by Wells: "[Man] wants to stand out, but not too far out, and, on the contrary, he wants to merge himself with a group, with some larger body, but not altogether." (318) or Rashid who "do [es] not belong anywhere" as Hazin, another character, tells him on page 94. He is an outcast, the other, as the following quotation illustrates: "He is among them, but he will never be one of them" (181). 9At the beginning of the novel, Rashid thinks: "Truly no man can fully understand the course of his life." (20) and all his life is dominated by a "quest for knowledge" (34) in which he "tries to make sense of things" (35). Reenacting the myth of Remus and Romulus, the narrator of The Carrier gives Rashid, and not his step brother Ismail, access to a Rome of knowledge. The Valley of Dreamers he is sent to coincidentally recalls the Valley of Rest: one of the Utopian valleys in Wells's Men like Gods. But since "everything is written in the stars" (128) as Rashid's old master says, a telescope seems a very useful instrument, a wonderful time and space machine as it were: "to perceive things over a day's ride away" (52). But Rashid's fate is rather dark. The one the local inhabitants dubbed "the moor" is soon compared with a "sea ape" (141) and his appearance makes of him "an unfortunate messenger from hell" (146). He is no longer a plain carrier, but "the carrier of some repulsive contagion" (170). 10As Rashid becomes a pariah, religion is described with an underlying irony: "They walk up the hill each morning because God is in His heaven and the world was created by Him and He has deemed that this be their existence." (179). The pariah is then pointed out by characters metonymically presented as the "three black hats". They appear on page 195 and have come from afar to denounce the evil which has befallen the community, inquire about the child's death and talk Heinesen out of his ambitious enterprise. As such they could be associated with the three wise men. They are all said to be different physically and are described in terms of what they own rather than what they are. The three men are not long speaking the words of God: "The stars are out of our reach and God intended for them to remain so", they say to Heinesen on page 200. Further, they are scared when they catch sight of Rashid whom they term "a Godforsaken creature". Unlike them, Heinesen dreams of "crack [ing] the secret of the universe" (210). Knowledge is thus clearly pitted against religion and the forbidden fruit is the fruit of knowledge out of which Rashid will feed: "[h] e would drink the ink, eat the paper." (220). Knowledge has a maternal, organic, rejuvenating and protecting power as illustrated by the following quotation: "These books contained the arcs of the heavens, the holy, unfathomable mystery which enclosed him, like a cocoon" (220). In fact, Rashid is terrified, because he is scared of losing "the one thing which has sustained him through all the years of his life—his religious faith." But "[a] s his appetite grows, so does his belief wane". (242). The reader finally witnesses the "divorce of faith from reason" (243). 11If Wells undoubtedly meant to criticize a Victorian society so sure of its superiority and strength, he also indirectly aimed at religion. Similarly, the narrator in The Carrier denounces the conceit ruling over the world, for example when Rashid sets foot in Spain: "It was a world preoccupied with itself, with matters further afield, aware that it was the hub of some much larger wheel." (74). As far as religion is concerned, Mahjoub finally chimes with Wellsian thought as the latter seems to suggest that if God exists at all, it is only in the form of a deified humanity revealed by/in the other—an ideal which unceasingly eludes the hero's grasp however determinate his quest may be. This gives Wells'fiction a certain sense of irony which has often been overlooked by critics. 13Mahjoub's hero finds himself in a strangely similar position "floating upward and backward through time" (278). He is using the telescope that "brings what is distant near" (276) and aiming it at the thick inky clouds above him and at the sun: "the great lamp of the world" (277). If the threat of entropy is evident, Mahjoub's fiction finally asserts its dystopian trait and thanks to the other, Rashid realizes that "science cannot lead us anywhere but back to ourselves". (278). CUDDON J. Α., Dictionary of Literary Terms and Literary Theory (1976). London, Penguin, 1998. HAMMOND J. R., A Preface to H. G. Wells. London, Longman & Pearson Education, 2001. MAHJOUB Jamal, The Carrier. London, Phoenix House, 1998. PARRINDER Patrick, "Wells and the Aesthetics of Utopia". L'esthétique de la science-fiction, Calliban N° XXII. Toulouse, Presse Universitaire du Mirail, 1985. SARTRE Jean-Paul, L’Être et le Néant: essai d'ontologie phénoménologique. Paris, Gallimard, 1960. WELLS H. G., A Modem Utopia (1905). Lincoln, University of Nebraska Press, 1967. —, The Island of Doctor Moreau (1896). London, Dent Rutland, Vermont: Tuttle, 1997. —, The Time Machine (1895). London: Dent/New-York, Dutton, 1969. —, Men Like Gods (1923). London, Sphere Books, 1977. 1 Utopia comes from a pun on the Greek name eutopia "place (where all is) well" based on ou "not" + topos "place". 2 Not in the same sense as Woolf or Lawrence but transitional between Realism and Modernism as Hammond says (151). BOUCHERAUD, Simon Dubois. "The divorce of faith from reason" from modernism to post-modernism: H.G.Wells'fiction and Jamal Mahjoub's The Carrier (1998) In : L'Autre : journée d'étude sur les auteurs et sujets des concours 2006 [en ligne]. Tours : Presses universitaires François-Rabelais, 2006 (généré le 23 avril 2019). Disponible sur Internet : <http://books.openedition.org/pufr/5759>. ISBN : 9782869064867. DOI : 10.4000/books.pufr.5759. Boucheraud, Simon Dubois. “"The divorce of faith from reason" from modernism to post-modernism: H.G.Wells'fiction and Jamal Mahjoub's The Carrier (1998)”. Naumann, Michel, et Dominique Daniel. 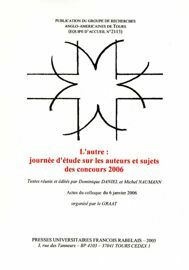 L'Autre : journée d'étude sur les auteurs et sujets des concours 2006. Tours : Presses universitaires François-Rabelais, 2006. (pp. 237-243) Web. <http://books.openedition.org/pufr/5759>.